In today's world, information is being generated at an incredible rate. However, unlocking insights from large datasets can be cumbersome and costly, even for experts. In these cases and many others, you use Cloud Dataflow’s data-centric model to easily express your data processing pipeline, monitor its execution, and get actionable insights from your data, free from the burden of deploying clusters, tuning configuration parameters, and optimizing resource usage. Just focus on your application, and leave the management, tuning, sweat and tears to Cloud Dataflow. Cloud Dataflow is based on a highly efficient and popular model used internally at Google, which evolved from MapReduce and successor technologies like Flume and MillWheel. The underlying service is language-agnostic. Our first SDK is for Java, and allows you to write your entire pipeline in a single program using intuitive Cloud Dataflow constructs to express application semantics. Cloud Dataflow represents all datasets, irrespective of size, uniformly via PCollections (“parallel collections”). A PCollection might be an in-memory collection, read from files on Cloud Storage, queried from a BigQuery table, read as a stream from a Pub/Sub topic, or calculated on demand by your custom code. Because PCollections can be arbitrarily large, Cloud Dataflow includes a rich library of PTransforms (“parallel transforms”), which you can customize with your own application logic. For example, ParDo (“parallel do”) runs your code over each element in a PCollection independently (like both the Map and Reduce functions in MapReduce or WHERE in SQL), and GroupByKey takes a PCollection of key-value pairs and groups together all pairs with the same key (like the Shuffle step of MapReduce or GROUP BY and JOIN in SQL). In addition, anyone can define new custom transformations by composing other transformations -- this extensibility lets you write reusable building blocks which can be shared across programs. Cloud Dataflow provides a starter set of these composed transforms out of the box, including Count, Top, and Mean. Writing in this modular, high-level style naturally leads to pipelines that make multiple logical passes over the same data. Cloud Dataflow automatically optimizes your data-centric pipeline code by collapsing multiple logical passes into a single execution pass. However, this doesn't turn the system into a black box: as you can see below, Cloud Dataflow’s monitoring UI uses the building block concept to show you the pipeline as you wrote it, not as the system chooses to execute it. Code snippet and monitoring UI from the Cloud Dataflow demo in the IO keynote. The same Cloud Dataflow pipeline may run in different ways, depending on the data sources. As you start designing or debugging, you can run against data local to your development environment. When you’re ready to scale up to real data, that same pipeline can run in parallel batch mode against data in Cloud Storage or in distributed real-time processing mode against data coming in via a Pub/Sub topic. This flexibility makes it trivial to transition between different stages in the application development lifecycle: to develop and test applications, to adapt an existing batch pipeline to track time-sensitive trends, or to fix a bug in a real-time pipeline and backfill the historical results. When you use Cloud Dataflow, you can focus solely on your application logic and let us handle everything else. You should not have to choose between scalability, ease of management and a simple coding model. With Cloud Dataflow, you can have it all. If you’d like to be notified of future updates about Cloud Dataflow, please join our Google Group. L-Release of Android, with material design: Bringing material design to Android is a big part of the L-Release of Android: we’ve added the new Material theme (which you can apply to your apps for a new style) and the ability to specify a view’s elevation, allowing you to cast dynamic, real-time shadows in your apps. Bringing material design to Polymer: As a developer, you’ll now have access to all the capabilities of material design via Polymer, bringing tangibility, bold graphics, and animations to your applications on the web, all at 60fps. Google Play services 5.0 is rolling out worldwide with great new features for developers. Android TV SDK — Explore, learn and build apps and games for the biggest screen in the home. Your hard work will pay off in the fall when Asus, Razer and other partners launch their first Android TV devices. 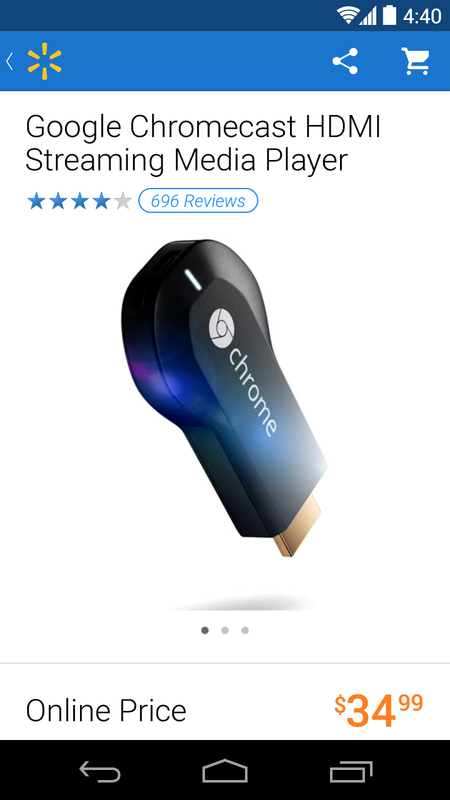 Google Cast SDK: Help users find your content more easily with the improved Google Cast SDK developer console, which lets your app get discovered on chromecast.com/apps and on Google Play. Android Auto SDK coming Bring your app experience to the car by extending your existing app with Android Auto APIs. Be in millions of cars - with just one app. Gaming: Learn what's new about Google Play Games and the Android platform to take games to the next level. Google Cloud Platform: Get help with debugging, tracing, and monitoring applications in with new developer productivity tooling. Also, try Cloud Dataflow, a new fully managed service that simplifies the process of creating data pipelines. Building successful global app businesses — Scalable solutions to help you find more users, understand and engage them, and effectively convert your active users into buyers. With the keynote behind us, we’ve still got two full days of session content for your viewing enjoyment at google.com/io. No matter where you are in the lifecyle of your app--whether you’re digging into user research, coming up against a tough technical challenge, or looking to get your app in the hands of millions of users--you can tune into the I/O Live stream for talks covering the themes of Design, Develop, and Distribute. Whether it’s the next viral game, social sharing app or hit SaaS application, the velocity of your innovation is driven by the productivity of your dev team. This week at Google I/O we talked about several new tools that enable developers to understand, diagnose and improve their systems in production. Today the state of the art of debugging for cloud applications isn’t much more than writing out diagnostic messages and spelunking the logs for them. When the right data is not being written to the logs, developers have to make a code change and redeploy the application to production. That is the last thing you want to do when investigating an issue in production. Traditional debuggers aren’t well suited for cloud-based services for two reasons. First, it is difficult to know which process to attach to. Second, stopping a process in production makes it hard to reproduce an issue and gives your end-users a bad experience. The Cloud Debugger completely changes this model. It allows developers to start where they know best - in the code. By simply setting a watchpoint on a line of code, the next time a request on any of your servers hits that line of code, you get a snapshot of all the local variables, parameters, instance variables and a full stack trace. This works no matter how many instances you are running in production. There is zero setup up time and no complex configuration to enable. The debugger is ideal for use in production. There is no overhead for enabling the debugger on a project and when a watchpoint is hit very little noticeable performance impact is seen by your users. Performance is an important feature of your service which directly correlates with end user satisfaction and retention. No one intends to build a slow service, but it can be extremely difficult to isolate the root cause of sluggishness when it happens. Especially when the issue hits only a fraction of your users. Cloud Trace helps you visualize and understand the time spent by your application for request processing. This enables you to quickly identify and fix performance bottlenecks. You can even compare performance from release to release with a detailed report. You can leave Cloud Trace enabled in production because it has very little performance overhead. In this screenshot, you can see we have investigated a particularly slow trace and we see a detailed breakdown of where the time is being spent. It looks like the problem could be these numerous sequential calls to Datastore, so maybe we should consider batching them. So we go update our service to batch the Datastore calls, and deploy the updated service. Now we can use Cloud Trace to verify the fix. As a developer, you can easily produce a report that shows the performance change in your service from one release to another. In the following report, the blue graph shows the performance without datastore batching and the orange graph shows the performance after releasing the change to use datastore batching. The X-axis of the graph represents the time taken (logarithmic scale) to service requests, and the left shift of the orange graph shows the significant performance gain due to Datastore batching. Cloud Monitoring provides rich dashboards and alerting capabilities that help developers find and fix performance problems quickly. You can configure alerts for any metric in the system, including those related to the performance of Cloud SQL databases, App Engine modules and versions, Pub/Sub topics and subscriptions, and Compute Engine VMs. With Compute Engine VMs, you can create alerts for both core system metrics (CPU, memory, etc.) and application services running in the VMs (Apache, Cassandra, MongoDB, etc.). Finally, you can create endpoint checks to monitor availability and response times for your end-user facing services. Endpoint checks are performed by probes in Oregon, Texas, Virginia, Amsterdam, and Singapore, enabling monitoring of latency from each of these five regions. Sometimes it is inevitable to connect directly to a VM to debug or fix a production issue. We know this can be a bit of a pain, especially when you are on the road, so now you can do that from just about anywhere. With our new browser based SSH client you can quickly and securely connect to any of your VMs from the Console. No need to install any SDK or tools. The best part is, this works from any desktop device with most major web browsers. Ready for a Spin? All of these features are just about ready for your applications. Stay tuned to this blog, we will post updates as they are more widely available. With over 1 billion active Android users, an increasing number of developers like you are building successful global businesses on Google Play. Since the last Google I/O, we’ve also paid out more than $5 billion to developers. This week at Google I/O, we announced new ways to help you build a successful business. These solutions work together at scale to help you find more users, understand and engage them, and effectively convert your active users into buyers. Last year, Google Play became an even better place to try new ideas. Since May 2013, Google Play offers Alpha and Beta Testing so that you can engage users early to get feedback on your new app. Feedback provided by users is private, allowing you to fix issues before publicly launching the app, and without impacting your public ratings and reviews. Over 80,000 apps on Google Play are actively using beta testing. You can also ensure new versions get a positive response by updating through staged rollouts. As your app business grows, you dedicate more time to release management. Today we announced the Google Play Developer Publishing API to help you scale your release operations. The new API will let you upload APKs, manage your in-app products and localized store listings. You will be able to integrate publishing operations with your release processes and toolchain through a RESTful API. With the Google Play Developer Publishing API you’ll spend less time managing your releases and more time managing your business. This API is currently in closed beta and we look forward to making it available to all developers. 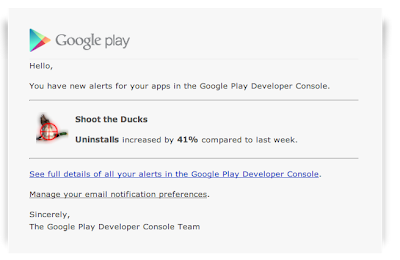 The Google Play Developer Console now offers more actionable insights into your app’s performance by sending you email notifications for Alerts and providing Optimization Tips. We’re also offering new revenue metrics including number of buyers and average revenue per paying user. You’ll also be able to export user reviews for further analysis. Click on Announcements in the Developer Console for a list of new features. 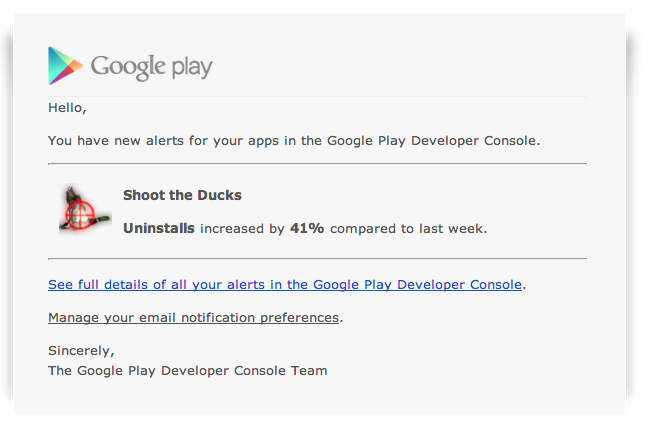 For game developers, we recently launched enhanced Play Games statistics on the Google Play Developer Console. You get a daily dashboard that visualizes player and engagement statistics for signed in users, including daily active users, retention analysis, and achievement and leaderboard performance. With AdWords, we're building a robust platform to help you promote your app and drive re-engagement. This week we are launching Installed App Category Targeting, a new way to promote your app to new users. It helps you reach potential customers across the AdMob network who have already installed apps from related categories on Google Play and other app stores. For example, an action-oriented game developer may wish to reach users who have previously installed apps from the category Action & Adventure Games. 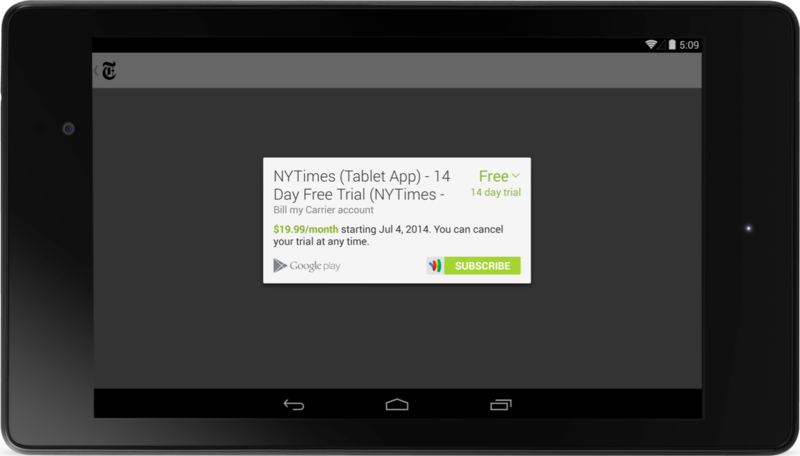 Ads can also remind users about the apps they already have. Through Google mobile display and search ads deep linking, you can re-engage users who have already installed your Android app by taking them directly to specific pages in the app. Let’s say someone has the Hotel Tonight app installed on their phone. If they search Google for “hotels in San Francisco," they'll see an ad that will open Hotel Tonight app and take them directly to a list of San Francisco hotels. This deep-linking is also available through search for all apps that implement app indexing. 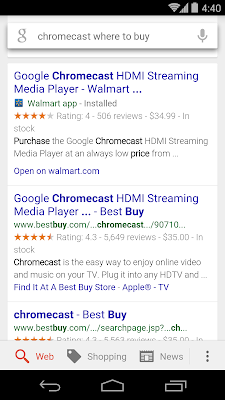 If a user with the Walmart Android app searches for “Chromecast where to buy”, they’ll go directly to the Chromecast page in the Walmart app. The new App Indexing API is now open to all Android developers, globally. Get started now. For game developers using Play Games, we announced a new Game Profile that is automatically customized based on the gameplay and achievements earned in those games. Since its launch last year, users have loved saving their game progress in the cloud. We’re now evolving this feature to Saved Games, where users can save up to 3 “bookmarks” of their progress in the Play Games app, complete with images and descriptions. Finally, we announced a new service called Quests — it you run online, time-based goals in your game; for example, players can collect bunch of in-game items on a specific day, and the quests services coordinates with your game to know who completed the goal. These APIs run events for your players, and reward them, without the need to update your game. Today, we announced that users who have set up Direct Carrier Billing on their smartphone can also make purchases on Google Play from their tablet, charging to the same mobile phone bill. In addition to our recent launch of payments through PayPal, these new user payment options expand monetization opportunities for your apps. As announced earlier this year, Google Analytics is now directly available in the AdMob interface, giving you powerful segmentation tools to determine the best monetization strategy for each user. For example, you might want to display in-app purchase ads to users most interested in buying, while showing regular ads to those less likely to buy right now. Once you’ve segmented your audience in this way, you can use AdMob to build interstitial ads that promote in-app purchase items to users at a point in your app that’s useful to them. This creates a more customized experience for users, can help prolong engagement and grow in-app purchase revenue. Learn more. If you're at Google I/O 2014, please join us at our breakout sessions today and tomorrow, where we'll be talking about these features in much more detail. (Add us to your calendar!) And if you can't make I/O, you can always join us on the livestream or watch the videos online later. Last summer, we launched Chromecast, a small, affordable device that lets you cast online video, music and anything from the web to your TV. Today at Google I/O, we announced Android TV, the newest form factor to the Android platform, and a way to extend the reach of Google Cast to more devices, like televisions, set-top boxes and consoles. Check out Coming to a Screen Near You for some details on everything we’re doing to make your TV the place to be. For developers though--sorry, you don’t get to unwind in front of the TV. We need you to get to work and help us create the best possible TV experience, with all of the new features announced at I/O today. In addition to Google Cast apps that send content to the TV, you can now build immersive native apps and console-style games on Android TV devices. These native apps work with TV remotes and gamepads, even if you don’t have your phone handy. The Android L Developer Preview SDK includes the new Leanback support library that allows you to design smoother, simpler, living room apps. And this is just the beginning. In the fall, new APIs will allow you to cast directly to these apps, so users can control the app with the phone, the remote, or even their Android Wear watch. You’ll also start seeing Android TV set-top boxes, consoles and televisions from Sony, TP Vision, Sharp, Asus, Razer and more. We want to help users more easily find your content, so we’ve improved the Google Cast SDK developer console to let you upload your app icon, app name, and app category for Android, iOS and Chrome. 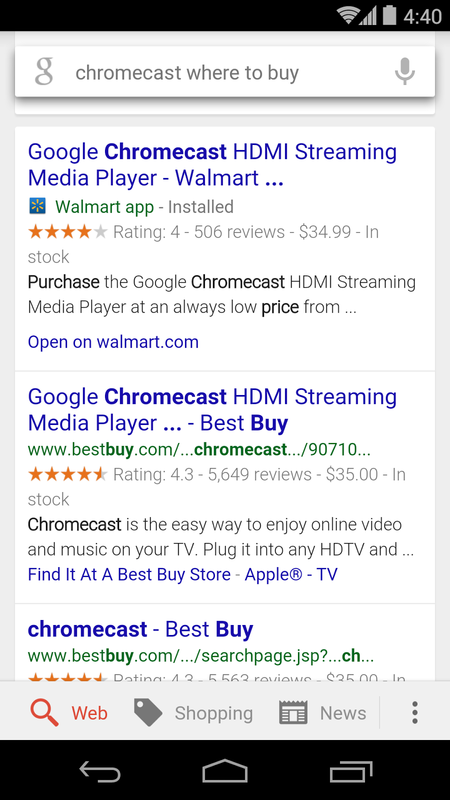 These changes will help your app get discovered on chromecast.com/apps and on Google Play. Additional capabilities have also been added to the Google Cast SDK. These include: Media Player Library enhancements, bringing easier integration with MPEG-DASH Smooth Streaming, and HLS. We’ve also added WebAudio & WebGL support, made the Cast Companion Library available, and added enhanced Closed Caption support. And coming soon, we will add support for queuing and ID delegation. Ready to get started? Visit developer.android.com/tv and developers.google.com/cast for the SDKs, style guides, tutorials, sample code, and the API references. You can also request an ADT-1 devkit to bootstrap your Android TV development. Apache, Nginx, MongoDB, MySQL, Tomcat, IIS, Redis, Elasticsearch and Cassandra are trademarks of their respective owners. When we started building for the first mobile devices, mobile meant less: less screen space, slower connection, fewer features. A mobile experience was often a lesser experience. But mobile devices have evolved—they have become more powerful, faster, and more intuitive—so must our approach to design. And as Google, including the Android platform, expands into new form factors, we’re introducing one consistent design that spans devices across mobile, desktop, and beyond. Today at Google I/O, we introduced material design, which uses tactile surfaces, bold graphic design, and fluid motion to create beautiful, intuitive experiences. In material design, surface and shadow establish a physical structure to explain what can be touched and what can move. Content is front and center, using principles of modern print design. Motion is meaningful, clarifying relationships and teaching with delightful details. We needed something that felt at home on the smallest watch, the largest TV, and every screen in between. We used it for Android Wear, our project to extend Android wearables, as well as Android TV, and Android Auto. So as you create applications and services for this expansive new range of devices, we’ve created one unified set of style guidelines that works across any platform. We’re releasing the first version of these guidelines as part of our preview today. You can find them on google.com/design. Bringing material design to Android is a big part of the L-Release of Android, the version we previewed today. We’ve added the new Material theme, which you can apply to your apps for a new style: it lets you easily infuse your own color palette into your app, and offers new system widgets, screen transitions and animated touch feedback. We’ve also added the ability to specify a view’s elevation, allowing you to raise UI elements and cast dynamic, real-time shadows in your apps. Last year at I/O we announced Polymer, an ambitious UI toolkit for the web. As a developer, you’ll now have access to all the capabilities of material design via Polymer, bringing tangibility, bold graphics, and smooth animations to your applications on the web. 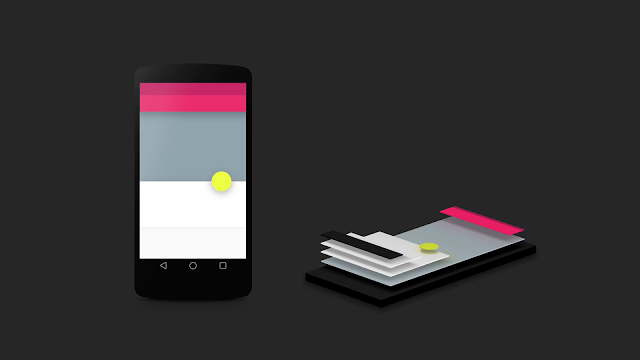 If you’d like to learn more about material design, please take a look at our guidelines. Join us as we continue to design and iterate at +Google Design. Less than one day to go until Google I/O 2014! In our third post on what to expect at Google I/O 2014, we'd like to share what’s coming up if you’re looking to grow your app distribution, engage users, and make money on Google Play. Making Money on Google Play || Wednesday, 1-1:45PM (room 4) Developers are finding great success on Google Play. In this session, we’ll review developer success stories and the drivers of revenue, and we’ll share tips for developers to get the most out of Google Play. Google Play Power Session || Wednesday, 2-2:45PM (room 4) The multi-device mobile app world presents huge opportunities for developers to connect with users, and Google Play is one of the richest and most competitive business ecosystems on the planet. Understand how to leverage the complete suite of Google products to make a great app, build your userbase, expand your app onto new device types, and reach people globally. Going Global with Google Play || Thursday, 9-9:45AM (room 7 - live streamed) Think your app or game has what it takes to become a global hit? Get key insights into major international markets and trends of successful apps and games in those regions. Leverage these pro tips and best practices to expand your game to a global audience. Maximize app engagement, monetization and distribution || Thursday, 2-2:45PM (room 7 - live streamed) You built an app. Awesome. Do you have a monetization plan? An easy way for your users to pay? Does anyone know about it? How are you tracking success? In addition to providing the platforms and tools to design and develop your apps, we also have solutions to help make it discoverable and more profitable. Learn how you can turn your app into a business by understanding your most valuable users, finding more of them, and tailoring the monetization experience for each different group. We can also help enable fast and seamless transactions so users can purchase products or services in your app. We’ll also be hosting ‘Box talks with Google product teams who will share best practices for distributing mobile, web, Glass and Google Cast apps, as well as broadening reach with Google+. In addition, we’ve invited entrepreneurs and VCs to discuss their experiences (and maybe even inspire the creation of a few great new businesses). Have specific questions and want to talk with experts? We’ll have designated Office Hours for Google Play, Google Wallet, AdMob and Google Analytics, and Knowledge Graph. For more info on how to grow your app business with Google, visit developers.android.com/distribute and developers.google.com/mobile. Ellie Powers is a product manager at Google Play, focused on developing the apps ecosystem. She joined Google to re-launch the Google Play Developer Console, and is now working to make Play the best place for developers and users alike. Join I/O 2014 from anywhere! The Keynote and selected sessions will be live streamed throughout the 2 days, on 4 different channels. Tune into google.com/io on June 25 starting at 9AM PDT to see everything from the comfort of your couch. Download the mobile app which allows you to access the live stream on the go, discover I/O-related conversations on Google+ and be reminded when sessions in your personalized schedule are about to start. Join an Extended event happening near you and watch I/O with friends. Put in your I/O requests and questions about what's happening on the ground. 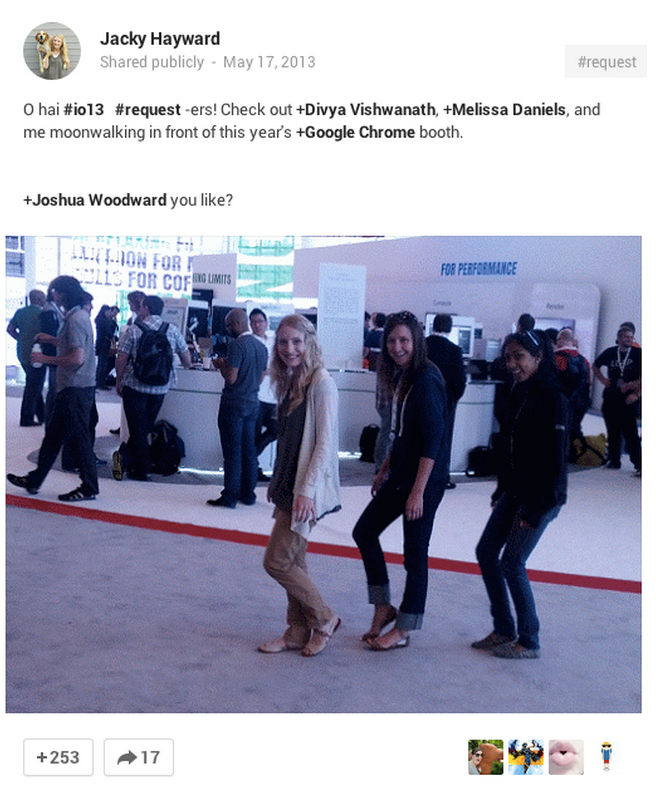 All you need is to post publicly on Google+ using the "#io14request" hashtag and it will be picked up and answered by our team of onsite community managers. Read more about the program here. Follow our +Google Developers feed so you learn about the conference announcements and highlights as they happen. If you’re interested in bringing the I/O live stream and Google+ social feed directly to your audience, customize and embed our Live Blogging Gadget on your website and/or blog. Get started here. Can’t wait for I/O to begin? Over the past few days, we have been rolling out I/O Bytes -- short videos to help developers like you dive in and experience I/O anywhere, anytime. Over 100 videos will be available on the Developers YouTube channel, throughout the I/O live stream, and on the I/O website once the event starts. 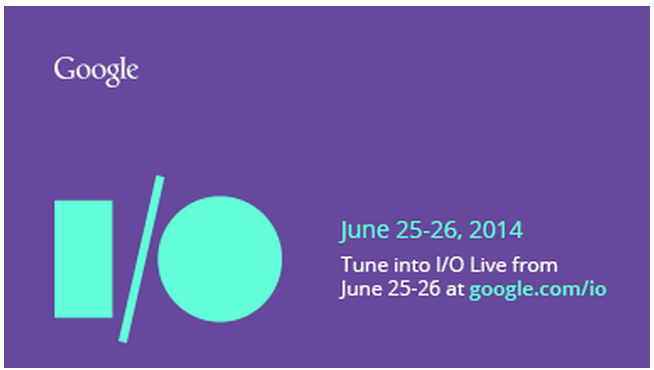 Google I/O 2014 will be live in less than 48 hours. Last Friday we shared a sneak peek of content and activities around design principles and techniques. This morning we’re excited to give a glimpse into what we have in store for develop experiences. Google I/O at its core has always been about providing you with the inspiration and resources to develop remarkable applications using Google’s platforms, tools and technologies. What’s new in Android || Wednesday 1-1:45PM (Room 8): Join us for a thrilling, guided tour of all the latest developments in Android technologies and APIs. 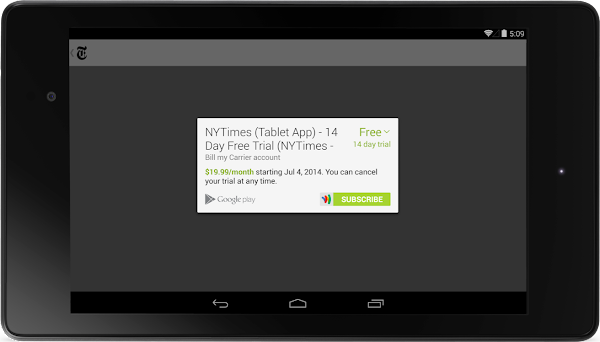 We’ll cover everything that’s new and improved in the Android platform since…well, since the last time. Making the mobile web fast, feature rich and beautiful || Thursday 10-10:45AM (Room 6): Reintroducing the mobile web! What is the mobile web good at? Why should developers build for it? And how do mobile web and native complement each other? The mobile web is often the first experience new users have with your brand and you're on the hook for delivering success to them. There's been massive investment in mobile browsers; so now we have the speed, the features, and the tools to help you make great mobile web apps. Predicting the future with the Google Cloud Platform || Thursday 4-4:45PM (Room 7): Can you predict the future using Big Data? Can you divine if your users will come back to your site or where the next social conflict will arise? And most importantly, can Brazil be defeated at soccer on their own turf? In this talk, we'll go through the process of data extraction, modelling and prediction as well as generating a live dashboard to visualize the results. We’ll demonstrate how you can use Google Cloud and Open Source technologies to make predictions about the biggest soccer matches in the world. You’ll see how to use Google BigQuery for data analytics and Monte Carlo simulations, as well as how to create machine learning models in R and pandas. We predict that after this talk you’ll have the necessary tools to cast your own eye on the future. In addition, we’ve invited notable speakers such as Ray Kurzweil, Regina Dugan, Peter Norvig, and a panel of robotics experts, hosted by Women Techmakers, and will be hosting two Solve for X workshops. These speakers are defining the future with their groundbreaking research and technology, and want to bring you along for the ride. Finally, we want to give you ample face to face time with the teams behind the products, so are hosting informal ‘Box talks for Accessibility, Android, Android NDK / Gaming Performance, Cloud, Chrome, Dart, and Go. Swing by the Develop Sandbox to connect, discuss, learn and maybe even have an app performance review. Reto Meier manages the Scalable Developer Advocacy team as part of Google's Developer Relations organization, and wrote Professional Android 4 Application Development. Google I/O 2014 is less than a week away, and we could not be more excited to show you what we have planned to help you create great experiences for your users. Over the next few days, we’ll be sharing things to look out for both in-person and virtually that highlight design principles and techniques, the latest tools and implementations with which to develop, and developer-minded products and strategies to help distribute your app. First up, design! SESSIONS: Designing for wearables || Wednesday, 4-5PM (Room 8): In this session, lead Google designers will discuss the process for Android Wear and Glass, and give tips for developers and designers working in this emerging space. By attending you’ll hear our take on new design approaches to wearable technology. This is just one of a number of sessions from Google user experience researchers and designers discussing our approach to cross-platform design, as well as opportunities to learn about testing and rapid prototyping. Filter by “Design, Sessions, Live Streaming” to find the design sessions we’ll be playing over the live stream. WORKSHOPS: Design sprints with Google Ventures || Thursday, 11AM -1PM (Workshop 1): We’ll offer a full slate of interactive workshops ranging from designing for Glass to effectively using data in your design processes, including this workshop on design techniques that you can use to gather data about customers, get your team focused on the same challenges, quickly sketch new ideas, and turn those sketches into prototypes. PANELS: Cross-platform design panel || Thursday, 1:15-2PM (Design Sandbox, Floor 2): This year, the sandbox will be alive with talks, panels and opportunities to meet directly with Googlers. During this panel, Google designers will share their thoughts on designing for multiple platforms, providing background information on how the design team creates consistent, intuitive and delightful experiences in a multi-platform world. There are many opportunities like this as well as for UX reviews and informal ‘Box talks in the Design Sandbox, offering you opportunities to connect with Googlers who share your passion for designing simple and engaging applications. To see the full Google I/O schedule, visit google.com/io. Roman Nurik is a Design Advocate at Google, helping designers and developers build amazing products on platforms like Android and the web. Just over two years ago, we launched mod_spdy, a plugin for the popular Apache Web Server that adds support for the SPDY protocol. At the time, our goal was both to speed up the web and help fuel the growth and adoption of SPDY by making it easy for Apache 2.2 users to install and enable SPDY on their sites. Today, SPDY is now widely adopted, officially supported by several web servers and many popular sites, and the IETF is using it as the basis for the upcoming HTTP/2.0 protocol. The time seems right for mod_spdy to cease being a third-party add-on, and to instead become a core part of Apache httpd. We’re pleased to announce that Google has formally donated mod_spdy’s code to the Apache Software Foundation, and it is now a part of the Apache httpd codebase. “The intent is to work on making it fully part of [Apache] 2.4 and, of course, a core part of 2.6/3.0” - Jim Jagielski, co-founder of the ASF. Being a part of Apache core will make SPDY support even more widely available for Apache httpd users, and pave the way for HTTP/2.0. It will also further improve that support over the original version of mod_spdy by better integrating SPDY and HTTP/2.0’s multiplexing features with the core part of the server. We’re grateful for all the adoption and feedback we’ve gotten from mod_spdy users over the past two years, and we’re very excited to see the Apache Software Foundation take it from here! Matthew Steele is a Software Engineer on the Google PageSpeed Insights Team in Cambridge, MA. He and his team focus on developing tools to help site owners make their sites faster and more usable. The web is a rich computing platform with unparalleled reach. In recent years, mobile devices have brought the web to billions of new users and introduced many new device capabilities, screen sizes, input methods, and more. To help developers navigate this brave new world, we built Web Fundamentals, a curated source for modern best practices. Today, we’re making it even easier to build multi-device experiences with the Beta release of the Web Starter Kit. Web Fundamentals' guidelines are intended to be fundamental to the platform: useful no matter which framework you choose or which browser your users run. We have articles about responsive layouts, forms, touch, media, performance, device capabilities, and setting up a development workflow. Articles cover both coding and design. For example, the article on layout design patterns explains both the usability tradeoffs between different layout options and how to implement them. The performance section complements PageSpeed Insights, an auditing tool that encourages instant (<1 second) mobile web sites. Designed to help you apply Web Fundamentals’ best practices in new projects, Web Starter Kit is a lightweight boilerplate with templates and tooling. Web Starter Kit gives you responsive layout, a visual style guide, and optional workflow features like performance optimization so you can keep your pages lean and fast. Both Web Fundamentals and the Web Starter Kit are actively developed and curated by a team of developers from Google and several open-source contributors. Our source code is available on GitHub, and we welcome contributions and feedback. Looking ahead, we’ll be adding new content and working with the web development community to refine our advice. Please file an issue or submit a pull request to help us capture web development best practices. 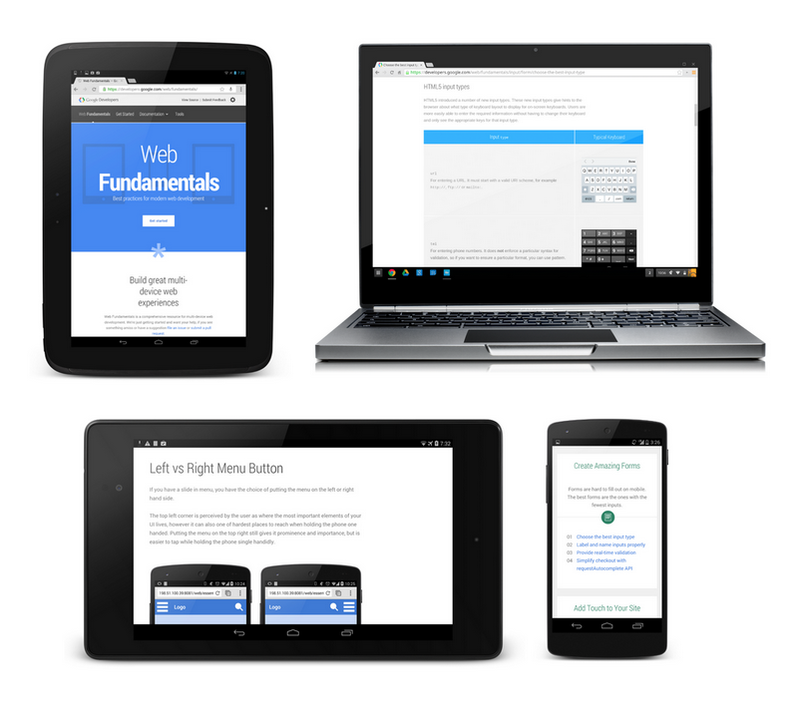 We look forward to a more modern, multi-device web! Once you’ve completed the course, the interactive quizzes, and the course project, you’ll know everything you need to make all of your mobile pages render in one second or less! We’re pleased to announce the Google I/O 2014 app is now available on Google Play! We designed the app to be your co-pilot to navigate the conference and make the best of I/O 2014, whether you’re attending in-person or remotely. This means you’ll be able to explore the full conference agenda, add events to a personalized schedule, find your next session on the map and enjoy facilitated pre-event WiFi configuration for those of you who will be joining us at Moscone. Find relevant content faster: Browse the full conference agenda and build your personalized schedule. With new filters for theme, topic and type of event, it's easy to find the content you want. Don't know what you are looking for? No problem! During the conference, the “Explore” screen always shows you what is happening right now and what's coming up, so you can decide where to go next. Plus, your schedule is kept in sync between your Android devices and the I/O website. Relive past I/Os: Watch videos from previous years in the “Video Library”, organized by year and topic. Sit back and catch up on those great talks as you refresh your skills and prepare for I/O 2014! Get reminded when and where it matters: The app will send you reminders when your sessions are about to begin, and once sessions end to provide feedback. 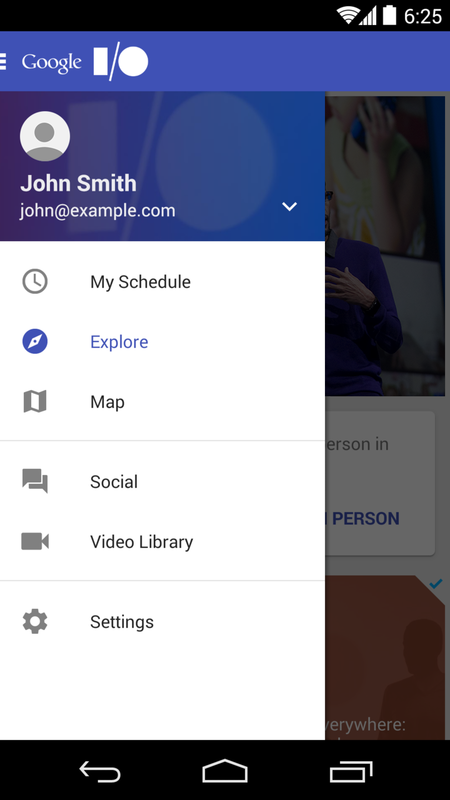 You can also enable Google Calendar integration (in the app Settings) so you can see your I/O and personal events all in one place across your devices. Enjoy I/O from anywhere: If you’re attending I/O remotely, you can enjoy live streamed content with closed captions directly from your device. Take advantage of extra screen space: When designing the app, we dedicated a lot of time thinking through how to design for different screen sizes, from phone to tablet. The result is a beautiful and optimized experience across Android devices. In addition to being useful to conference attendees, the I/O app serves as a real-life example of best practices for Android app development, and will be open-sourced shortly. Stay tuned! We hope you are as excited as we are about this year’s conference! So have some fun exploring the things I/O 2014 has to offer, starting today - download the app here. 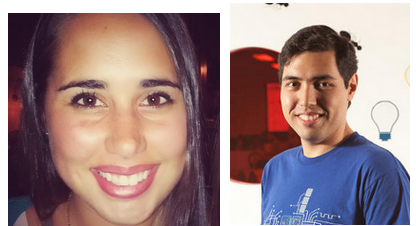 Mónica Bagagem is part of the Developer Marketing team, working on Google I/O and supporting Designer related efforts. She is a world traveler and a brunch lover. Bruno Oliveira is a member of the Developer Relations team and is the Tech Lead for the Google I/O 2014 app. He is a geek who enjoys code, photography, sci-fi and old games with big pixels and square waves.